Summary: Nora hasn't seen Clare for ten years. Not since the day Nora walked out of her old life and never looked back. Until, out of the blue, an invitation to Clare's hen party arrives. A weekend in a remote cottage - the perfect opportunity for Nora to reconnect with her best friend, to put the past behind her. I had seen this book around and as my TBR pile is super huge and isn't getting shorter any quicker I forgot about it. That's until I saw the Poppy Loves Book Clubs April read. I had been wanting to get involved for a while but since starting my new job in January I haven't read half as much as I would like but this time I made the time and my what a read it was. The saddest thing is that due to work commitments I was unable to attend the book club after all and I truly loved this book. Ruth writes amazingly from the very beginning I adored Nora, she's a loveable character who has had a hard time but has got on with her life. What I really enjoyed about this book was that us the readers were seeing the story evolve as Nora was - although none of us saw the outcome even though there are little hints that if you really thought about it you would have sat there and said. No! that makes no sense yet you don't see it until it's pointed out to you. The hen party was a strange experience and you can see why Nora and Nina weren't sure why they wanted to attend but they both decided if one of them was up for it they both would go. In meeting Clare I honestly wasn't sure how Nora and Clare were ever best friends. Clare is a dare devil who wants everything and usually gets what she wants a spoilt brat. Whereas Nora has strived to work for herself enjoys her writing and runs to blow off steam. I must admit Nora has made me want to run, I have got better with walking a lot more and I aim to start the Couchto5k soon - watch this space. Flo was the weirdest character for me she was just too much, I have bought a few similar or the same clothes items to my best friend in the past but I DO NOT HAVE AN ENTIRE WARDROBE THE SAME. Although Flo really is naïve and in the end I feel sooo sorry for her. I cannot say too much without ruining the intrigue and suspense that Ruth has created, but as they say keep your friends close and your enemies closer really is the truth. We trust our inner circles with secrets and lies we never want told, but whose to say they won't use them to destroy you and your credibility. 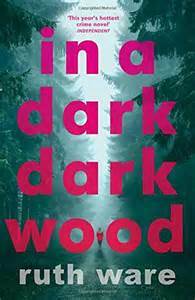 I totally loved this and Ruth's next novel 'the woman in cabin 10' is available as an e-book from 30th June and in paperback next year. I will be pre-ordering this.